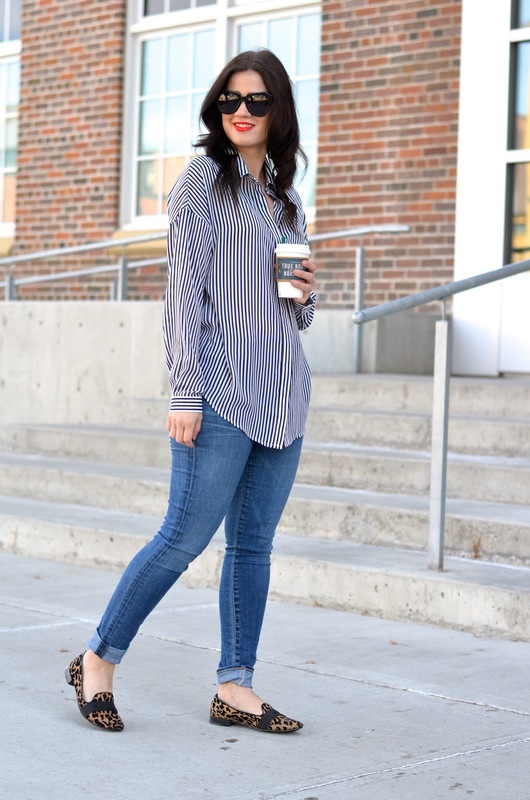 There is something so comforting about a oversized men's inspired shirt. I've been on the lookout for one that was cute and not super masculine fitting for a while and I finally found one on sale at Urban Outfitters. It's sadly sold out online but you may have some luck in the sale sections in store! I love that it has the added feature of the split back. It was perfect for the weekend of running errands and walking around my neighbourhood. Calgary has been blessed with amazing weather lately and I couldn't be more happy about it. I'm so looking forward to the longer days (a blogger dream) and sunshine! I'd also like to introduce my new Karen Walker sunnies! As you know, I've been addicted to wearing my tortoise ones and I took the plunge and got these ones. I'm usually not a fan of big sunglasses but these are so glamorous! Perfect for my upcoming beach vacay.. which is um THIS WEEK! Love this shirt! The problem I always have with this style is finding fabric that flows and isn't insanity to iron. Looks like the hot ticket!